with your favorite Hemp HeartsTM (shelled hemp seeds) Recipe. Digestive systems function best with raw, unprocessed foods that release nutrients slowly and continuously. The long fibers in raw, unprocessed foods remain intact to tie wastes together so they are able to move with contractions through the digestive system. 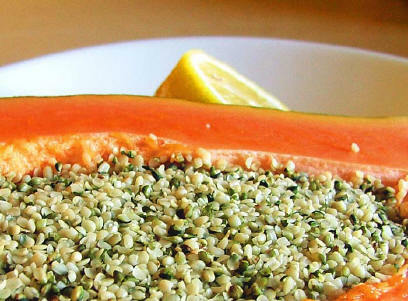 Those who consume Hemp HeartsTM (shelled hemp seeds) with long fiber foods normally expel wastes after every meal. Those without excess weight who wish to "turbo-charge" themselves for amazing productivity and those who need to rebuild their bodies after serious illness can consume Hemp HeartsTM (shelled hemp seeds) again in the afternoon. Those who change to Hemp HeartsTM (shelled hemp seeds) and long fiber foods, but who do not strictly avoid starches, may sometimes experience gas and watery stools as liquefied, incompletely digested starches are swept through the digestive system by faster moving Hemp HeartsTM (shelled hemp seeds) and long fiber foods. If you have a protein shake as your morning meal, blend your Hemp HeartsTM (shelled hemp seeds) in with your shake. Incorporate them into your home baking. Check out our recipe page for some tasty baked goods with Hemp HeartsTM (shelled hemp seeds) in them. 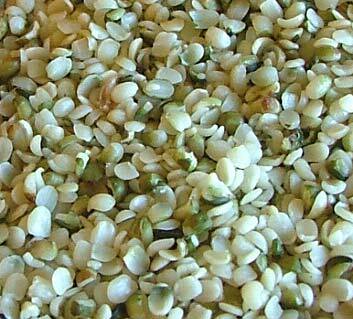 Our recommended minimum daily intake of Hemp HeartsTM (shelled hemp seeds) is a 52 grams (5 heaping tablespoons) serving. Larger individuals or those suffering with chronic health conditions such as arthritis, high blood pressure, high cholesterol, cardio vascular disease, acne, eczema, psoriasis, diabetes, circulation problems, intestinal problems, constipation, obesity or prostate problems (to name a few) may want to consider taking 55 grams (5 to 6 heaping tablespoons) a day. Take at least most of your daily intake of Hemp HeartsTM (shelled hemp seeds) first thing in the morning. This helps reduce cravings for sweets and carbohydrates throughout the rest of your day. In addition, efforts to reduce if not eliminate foods that contain sugars, starches, flour, pasta, potatoes and rice from your daily diet will drastically improve your benefits from Hemp HeartsTM (shelled hemp seeds) . Reducing or eliminating these unnecessary and unhealthy foods from your diet and replacing them with Hemp HeartsTM (shelled hemp seeds), a perfect and natural blend of proteins, essential fats (Omega 3 & 6), vitamins, calcium and enzymes, is a great first step in your journey to improved health and quality of life. Hemp HeartsTM (shelled hemp seeds) WITH RAW FRUIT OR VEGETABLES: Fill a bowl with selected fruit or vegetable pieces; Cover them with plain yogurt and top with five heaping tablespoons of Hemp HeartsTM (shelled hemp seeds). Or, remove the seed: from half a melon or half a papaya; Fill the hole with plain yogurt and cover with five heaping tablespoons of Hemp HeartsTM (shelled hemp seeds); If you also top with berries or sweet seedless grapes--nothing tastes better. HOT OR COLD CEREALS: Cover your favorite hot or cold cereal with five heaping tablespoons of raw Hemp HeartsTM (shelled hemp seeds). Top with some grapes or berries. Enjoy the great nutty taste. You will discover tremendous energy and will have no hunger for many hours. DESERTS, APPETIZERS AND EATING OUT: You can make a perfectly balanced and nutritious meal out of any desert or appetizer simply by topping it with several tablespoons of Hemp HeartsTM (shelled hemp seeds). Even the worst restaurants have something that can be salvaged by adding sufficient Hemp HeartsTM (shelled hemp seeds). SALADS AND PITAS: Add Hemp HeartsTM (shelled hemp seeds) in quantity on top or mix throughout. Use plenty to enhance flavor, texture and nutritional value. Blend with other ingredients in spreads and dressings. STIR-FRY: Add Hemp HeartsTM (shelled hemp seeds) generously and mix throughout shortly before serving. Sprinkle on top after serving. ROASTING MEATS: Make coatings and basting sauces mostly with Hemp HeartsTM (shelled hemp seeds). Apply before and while cooking. Use in dressings for added flavor and improved nutritional value. SHAKES, FRUIT SMOOTHIES AND HEMP MILK: Blend 1/3 cup Hemp HeartsTM (shelled hemp seeds) with 2/3 cup water on high speed for 2 minutes; Add frozen berries while blending. Can be sweetened. Without fruit, make hemp milk for many uses. SHANNON'S FAMOUS HEMP CRISPS: (smaller recipe): Add 2/3 cup brown sugar and one beaten egg to 1/2 cup cooled melted butter and blend well. Mix 1/2 cup flour, 1 tsp. cinnamon and one cup Hemp HeartsTM (shelled hemp seeds) separately. Add the dry mix to the butter mix. Spoon drop and flatten dough on a lightly greased cookie sheet and bake at 350 F until the edges are very crispy. For lighter, more porous cookies increase egg and/ or decrease flour slightly; do not over-mix dough and do not let mixed dough sit long before cooking. SHANNON'S MEDITERRANEAN HIGH PROTEIN HIGH ESSENTIAL FAT SALAD DRESSING: Blend 1 cup of Hemp HeartsTM (shelled hemp seeds) with 2/3 cup of water until smooth. Add 2 tablespoons of crumbled feta cheese, 3 teaspoons of red wine vinegar or lemon juice, 1'/a teaspoons of crushed garlic and 1 teaspoon of oregano with fresh ground pepper and salt to taste. No one will believe that it does not contain any olive oil. SHANNON'S HEMP CHICKEN: Mix 1/3 cup ketchup, two 1/4 oz. beef bouillon packets, 1 tablespoon onion flakes or 1 small diced onion, 2 teaspoons light soy sauce, 1 teaspoon mustard, 3 tablespoons water and 1 cup Hemp HeartsTM (shelled hemp seeds) in a small bowl. Arrange 3 pounds of chicken pieces in 3 quart casserole. Apply Hemp Heart mixture thoroughly over chicken pieces. Cover casserole and cook in a 350 F oven for 1 hour. Uncover and brown for approx. 30 minutes. Top with ½ cup of plain yogurt and eight heaping tablespoons of Hemp HeartsTM (shelled hemp seeds). Add Hemp HeartsTM (shelled hemp seeds). - Place 1 cup freshly roasted almonds in a glass jar. - Cover with 4 cups water. - Tightly close the jar. - Refrigerate for 1 day or no more than 2 days. - Pour into blender and blend until smooth. to squeeze out all liquid. - Add HempHearts and stir briskly. Use almond milk in recipes or as a delicious drink by itself or with a little honey and vanilla. Evenly spread granola in an 11 x 11 inch glass baking dish. Add sunflower, pumpkin, flax and hemp seeds to the granola and mix well. on high until hot but not boiling. Drizzle honey mixture over the granola, mixing well until evenly coated. Spread evenly and bake mixture for another 20 to 25 minutes, stirring occasionally. Cool to room temperature before storing in an air-tight container. Take your favorite Hot or Cold Cereal and top it with five heaping tablespoons of Hemp HeartsTM (shelled hemp seeds). Top with seedless grapes or fresh berries. In large saucepan: Poach chicken breasts in water, add poaching spices and cook on medium heat, turning chicken over once or twice, for 20 -25 min. Do NOT boil or over cook! (Chicken will be tough). Let chicken sit in broth for 10 min. more to ensure it is cooked through. Remove chicken from pan; place in dish to cool in the fridge 2-3 hours. Strain broth with sieve; place in a sealed container for use another time. Meanwhile-Heat oven to 325, place walnuts in pie tin or dish and roast for 5-6 min. DO NOT OVER COOK! Let cool 10-15 min. Break into small pieces, enough for 3/4 cup. After chicken has cooled, cube chicken. In large bowl, with wooden spoon, gently m ix together remaining salad ingredients chill at least 1 hour before serving. Use a sharp knife or it chicken will come out shredded. Add Mayo AFTER adding hemp oil, and then add Mayo. You will be surprised how much the chicken absorbs the hemp oil and Mayo, especially overnight. I usually add ¼ more hemp oil the next day. Suit yourself. Blend Hemp HeartsTM (shelled hemp seeds) into your morning protein shakes for an extra boost of energy and nutrition. Take your Hemp HeartsTM (shelled hemp seeds) with you when you eat out in restaurants. Simply sprinkle generous amounts of Hemp HeartsTM (shelled hemp seeds) over your meal to quickly enhance the nutritional value of the meal … even in the restaurant. If you are making yourself a wrap or pita, don’t forget to add your Hemp HeartsTM (shelled hemp seeds) before you close it up. Make Hemp milk. (see above) then make your favorite milkshake using your hemp milk, ice cream or yogurt, a cup of your favorite fresh (or frozen berries) 2 oz. of Hemp HeartsTM (shelled hemp seeds) and blend. Add ice if desired before blending. Incorporate Hemp HeartsTM (shelled hemp seeds) into your coatings and bastings for meats. Apply before and while cooking. Mix it in with your ground beef to have delicious hemp beef burger patties. No matter how you use them, Hemp HeartsTM (shelled hemp seeds) are a quick and convenient way to add flavor and instant nutritional value to most anything. Copyright 2002 - 2012 by Healing Source Ltd.